"Mint" is the name given to dozens of types of ground-hugging plants and small shrubs that produce strong-scented and -flavored leaves. It can be used as a dried herb or fresh in salads, and is also used as a ground cover or garden accent plant. Make cuttings off of your mint plant to either dry the herb for storage or to start new mint plants and expand your mint collection. Cut the top 2 to 3 inches off of a new green-stemmed mint branch. Make the cut just below a leaf node. A leaf node is the small bump on the stem where leaves emerge. 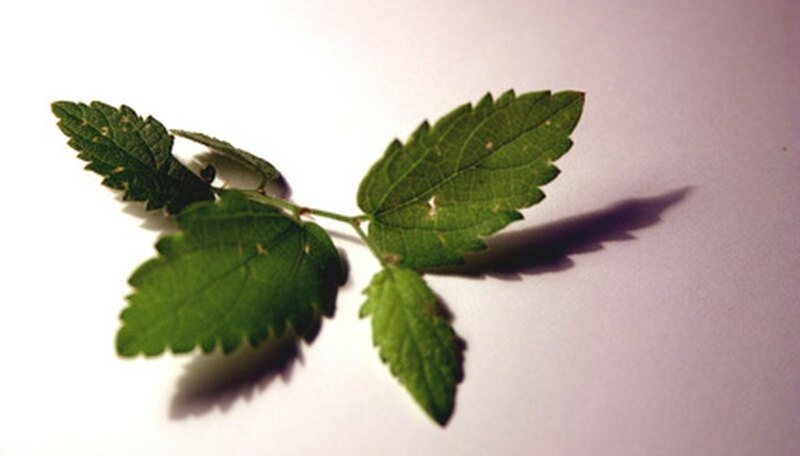 Use your fingers and pluck off all of the leaves on the cut mint stem except for the bunch of leaves at the tip. This minimizes the moisture the cutting looses through evaporation. Place the cutting vertically into a container filled with water so that the bottom inch of the cut stem is submerged. Change the water twice a day and use room temperature water. Roots will develop within 2 to 3 weeks, after which you may plant the rooted cutting in a pot or outdoors in your garden. If you wish to hasten the rooting process, dip the mint cutting in a rooting powder. Sever a branch off of your mint plant, making the cut right above a leaf node. Choose a branch that's approximately 6 inches long and has fully developed leaves that are not shriveled or wilted. Hang the branch upside down using a piece of string. If you're drying several branches, tie them together into a bunch before hanging. Suspend the branches in a cool and dry area. Wait for 2 to 3 weeks, or until the mint leaves are dry, crackle to the touch and break into tiny pieces when squeezed. Remove the hanging branches from the string and store in a sealed container or plastic bag. For best results, cut the mint in the midmorning when temperatures are still relatively cool but the dew has burned off.